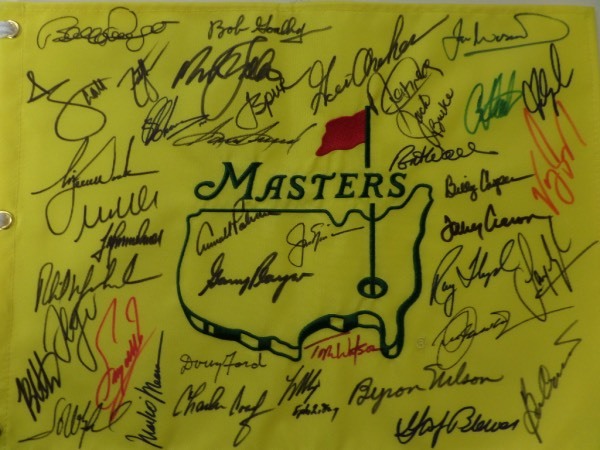 Coach's Corner - "Masters Winners" group signed golf pin flag. Go Back to Lot List "Masters Winners" group signed golf pin flag. Yes, another signed pin flag and yes, it will sell high and NOT get returned, like the other 14 we've sold. It is a gem, a custom heavy embroidered flag, and a full-sized 14x18 in size. It comes sharpie signed by about 30, all of whom have won the most coveted golf price at Augusta. I see autographs from Byron Nelson, Gary Player, Ray Floyd, Billy Casper, Phil Mickleson, Tiger Woods, Jack Nicklaus, Arnold Palmer and more. It grades a clean bold 10 all over, has NO dogs, just winners, as well as Lee's added approval.